An exciting story is unfolding in Savannah, Ga. This small, historic city of about 150,000 is a coalition of forward-looking leaders promoting economic growth through creativity and collaboration. 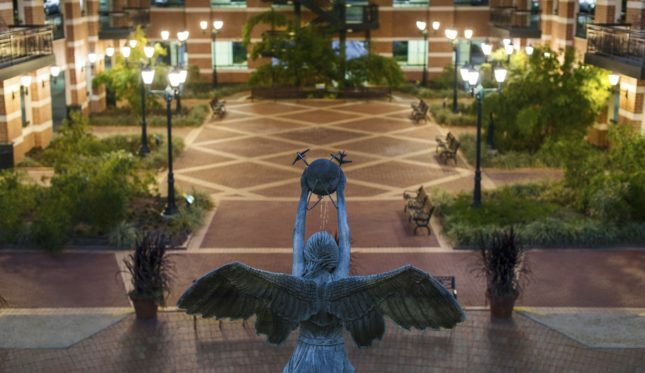 The goal: to build a city that cherishes its unique past yet isn’t afraid to evolve. 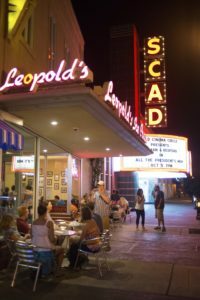 “Savannah presents an unexpected and evocative visitor experience,” says Joseph Marinelli, president of Visit Savannah. “The affluent visitor comes here to get away from their hectic and pressure-filled lifestyle and finds a city that’s casually paced but flourishing.” In 2017, more than 14 million travelers visited. And, 1,500 new hotel rooms are coming on line, upping the total to 16,500. More than the airport is growing. On Savannah’s famed River Street, a new entertainment district called Plant Riverside is rising from the painstaking redevelopment of vacated industrial buildings. The mixture of hotels, shops, restaurants, parks and plazas will employ 700 workers. And near the eastern-end of the riverfront, the $140 million Canal District will be anchored by a new 9,000-seat arena, retail and residential condos. Another engine of economic expansion is the Port of Savannah, one of the nation’s fastest-growing centers of shipping. Executive director Griff Lynch recently unveiled the Big Berth/Big Ship, which will enable the port to simultaneously handle six 14,000 20-foot equivalent unit(s) vessels—often referred to as mega ships—by 2024. “No other single container terminal in the U.S. has the ability to expand berth capacity at this rate,” says Lynch. Further upgrades over the next five years, he reports, include 21 NeoPanamax cranes and the replacement of 14 older models. Another advocate for economic growth is Hugh “Trip” Tollison, president and CEO of the Savannah Economic Development Authority. “The city’s growth is not an accident,” Tollison says. 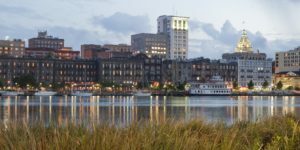 “Each of our core industries—tourism, healthcare, port logistics, advanced manufacturing, entertainment production, creative technologies—has thrived because our leadership has taken strategic steps to nurture growth and development.” For residents and visitors alike, the results are clear: Savannah’s global economic appeal is accelerating at a rapid pace, and that’s exactly what they had in mind.